SIGN UP FOR EVENTS HERE! Whether you’re a brand new roleplayer or a seasoned vet on their 5th Edition of D&D, join us for Adventurer’s League! We have complete starter sets starting at $19.99! Want a premade character? Print one off here! The D&D Adventurers League is an ongoing official organized play campaign for Dungeons & Dragons. It uses the fifth edition of the Dungeons & Dragons rules, and features the Forgotten Realms setting. 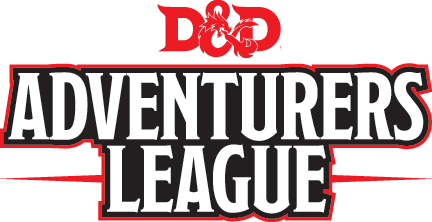 You can play D&D Adventurers League games at any place that features adventures bearing the D&D Adventurers League logo. You can create a character and bring that character to games anywhere D&D Adventurers League is supported. Most D&D Adventurers League games are public, in-person play events. Typical venues for these events are game and hobby stores, conventions, and public-accessible game day events. With the Elemental Evil storyline, you’ll have three paths you can take to begin on the road to adventure with a new character. This is recommended for casual D&D players or those who want to experience the main storyline through game play. If you finish the whole adventure, surviving characters will be around 15th level! You can do this as a part of the D&D Encounters program in stores or play at home. Either way, as long as you track your play sessions on a D&D Adventurers League logsheet, it’s all official. Note that if you play it as a part of the D&D Encounters program, your DM will get the a portion of the adventure complimentary as a part of the program, which will take characters through their first few levels, providing weekly play for a few months. The Lost Mine of Phandelver is recommended for new D&D players and DMs. It’s a great way to introduce folks to D&D, and you can find it in the D&D Starter Set. Playing through the whole adventure will take surviving characters to 5th level. You can play this at home or as a part of an in-store play event if your store has one. It will take several play sessions to complete it. Once again, tracking this adventure on a D&D Adventurers League log sheet makes it official — you get to keep all your rewards no matter where you go next!